From the drop down menu select -> Bookmarks -> Import Bookmarks and Settings. That's it! Done. I would be remiss not to mention the one major drawback to Chrome. Unfortunately, School Space does not play well with the Chrome browser. School Space only works in Internet Explorer. However, there is a solution to this problem. The Chrome Web Store offers a free extension that will allow teachers and students to access School Space in Chrome. Please take a moment to view the video below. It will walk you through the process of installing the IE Multi-Tab (Enhance) extension. After installing this extension you will be able to view School Space in Chrome. Say goodbye to Internet Explorer once and for all. 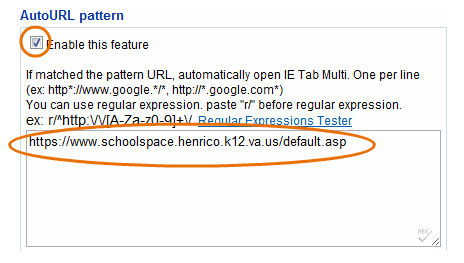 Are you looking for a way to have School Space open automatically without having to click the IE Multi Tab button? This can be easily accomplished by right clicking on the IE Multi Tab button in the toolbar and clicking --> Options. Locate AutoURL pattern and click the box Enable this feature. Paste the School Space Url in the text box and click Save. Next time you visit School Space it will automatically launch in Chrome!